The day dawned sunny and hot. 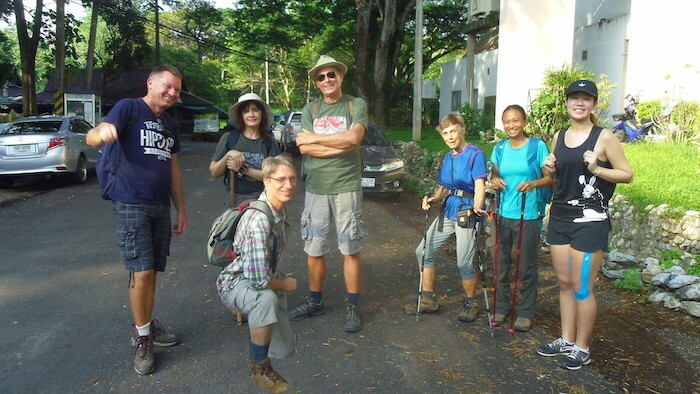 When 7 hikers met at the Arboretum anticipating a hike to visit 3 waterfalls, the leader had to explain that since a portion of the trail, which was an essential connection, has disappeared, we would only be visiting 2 waterfalls. 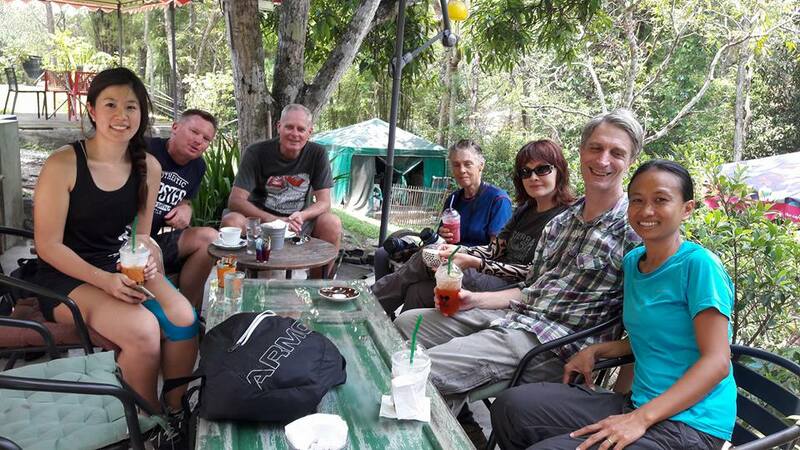 At 7:45 we left for Huay Kaew waterfall and had a short water break at the sala of Wang Bua Baan, and then continued right on to Chang Khian waterfall. On the way we found that parts of the trail were rather neglected, and in fact another connecting portion was so overgrown we couldn’t see it and so detoured around it. But the waterfall was still there and fully met our expectations. 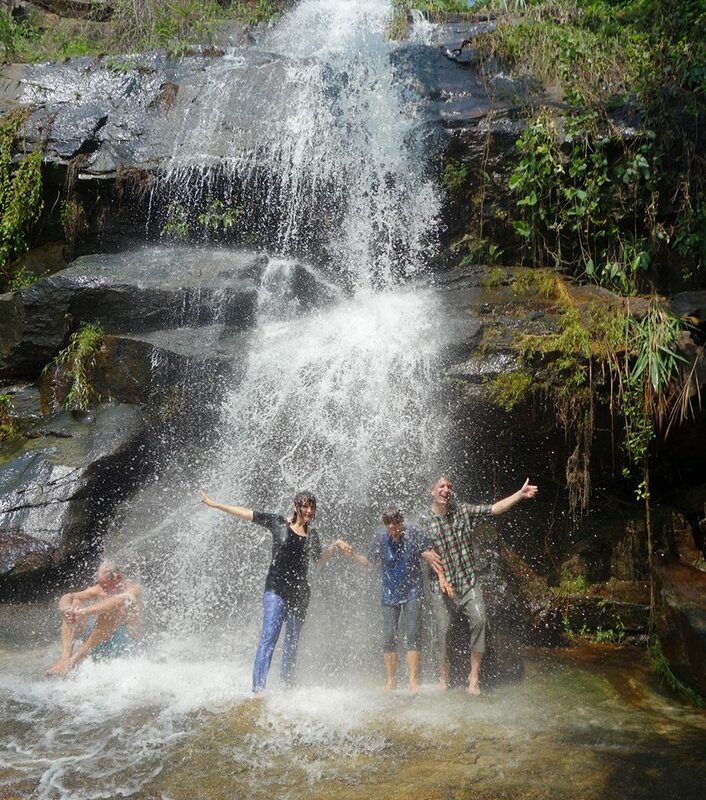 As soon as we got our boots off we were under the refreshing spray and then under the force of the pounding falls. Quite a massage, invigorating and dizzying! Wet shirts were spread out to dry while we enjoyed our pack lunches or snacks, even though it was still well before noon. As we started back on a different route, at first we found the trail again neglected, other than by red ants. Things improved as we progressed, and soon we had come out near the Boy Scout Camp and headed back toward the Arboretum, making a rather lengthy stop at a lovely cafe. Having a small and pleasant group was quite a treat as we each had opportunity to visit with each of the others.